A Free Bootstrap 4 Backend Admin Dashboard Template with eye catchy color combinations, spacious cards, graphics and all necessary plugins. 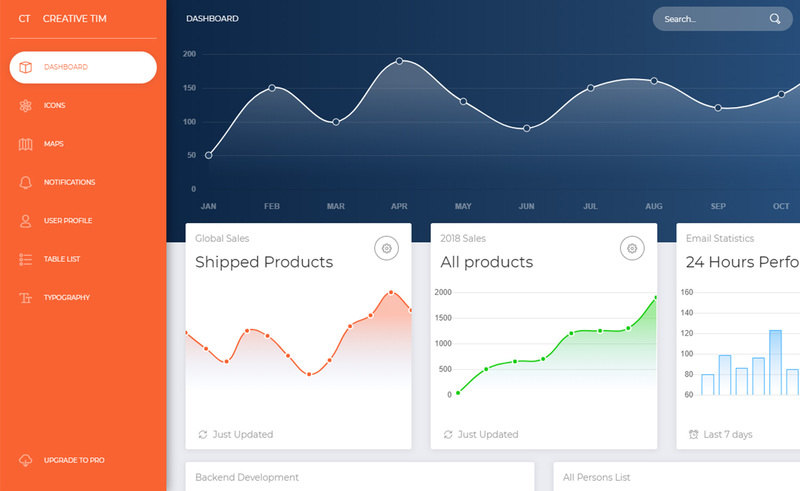 Now UI Dashboard, a splendid implementation of Now UI Kit and a Free Bootstrap 4 Backend Admin Dashboard Template. Beautiful typography, a handful of plugins and customizability makes this backend panel one of a kind. This free HTML5 template is a beautiful blend of eye-catchy colors & graphics. It comes packed with plugins those are useful to you, avoiding the rarely used ones. Which makes sure, the template remains lightweight, user-friendly yet strong and powerful. The admin dashboard template has a left aligned navigation menu from which you can keep track of your projects. You can choose from 5 pre-defined navigation menu colors. Various types of on-hover animation enabled graphs, necessary bars & checklists are present. 100 handcrafted icons adds to it’s usability. Typography includes various header, text, paragraph or quotes. Additionally, there are different types of tables too. You can create and maintain a profile with the proper use of user profile page. Then, there is various notification styles and options you can make use of. What makes this template truly interesting is its available documentation page, which is not very common to find among free templates. Built with the latest Bootstrap 4 ensure responsiveness, mobile friendliness from anywhere. The free Bootstrap template also includes a google map scheme as well. Built-in search box, drop-down menu and call to action buttons enhance its beauty for sure. This dashboard can easily be used as a control panel of an application or console. This free template is jointly created by Creative Tim and Invision. As both the UI kit and the Free Bootstrap 4 Backend Admin Dashboard Template contains same characteristics & layout, you can use them both at the same time. Themewagon is a great hub for Free HTML5 Templates. Take this dashboard for example, it’s a implementation of a UI kit. Now UI Dashboard is solely based on Now Ui Kit. So, you should explore all the free as well as quality checked, Premium template we offer. It is a free template. Thank you for sharing the template, as a download and you can remove the foot kick from the template page?